The Hurckes family, along with many friends and family, will once again this year continue to celebrate the birthday of their daughter Megan, who passed away in a tragic ATV accident in September of 2009, with their annual bowling fundraiser to support the Megan Hurckes Scholarship Fund. bowling and loved to have big parties, so this celebration for her birthday is our way of celebrating her life,” stated her father, Jerry. The family was on a Labor Day weekend vacation when the accident occurred, and since then the Hurckes family has worked diligently to keep Megan’s memory alive by starting a scholarship fund for local students in grammar school and high school. The scholarship fund also helps families by funding scholarships for the Westside Baseball program as well as the Oak Lawn Children’s Museum. 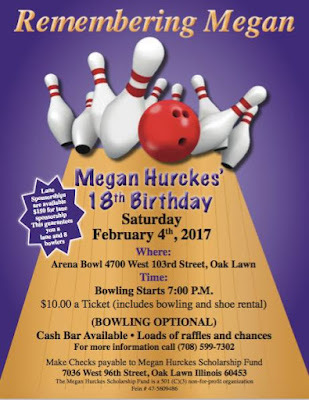 The “Megan Hurckes Bowling Birthday Bash”, family bowling event is scheduled for Saturday, February 4 at Arena Lanes, 4701 West 103rd Street, Oak Lawn starting at 7:00 p.m.